Sometimes all you can do is pretend. Even though it's real, it still makes you feel better. Oh hey, if you like what I do with this comic or anything else online, support me on Patreon (for just a buck-a-month if you want!) or buy my long-form comic, INKSTREME BALLPOINT ADVENTURES, or just buy me a coffee! Every bit helps! It's the last strip of 2016! Naturally, I had to go out with a dig at Trump. I mean, the layers of untrustworthiness are many and thick and obvious. However, all I need to know is that I disagree with what this man says. I mean, in some ways, he doesn't even say anything when he says things. I am going to have a hard time over the next 4 years. Let's hope impeachment proceedings begin on January 21, 2017. Oh, and hey, if you like what I do with this comic or anything else online, support me on Patreon (for just a buck-a-month if you want!) or buy my long-form comic, INKSTREME BALLPOINT ADVENTURES, or just buy me a coffee! Every bit helps! From 2006: Billy wonders about our leaders but Barbie just wonders. The question now is: what do we do about our leaders not actually having our interests at heart? If you like what I do with this comic or anything else online, support me on Patreon (for just a buck-a-month if you want!) or buy my long-form comic, INKSTREME BALLPOINT ADVENTURES, or just buy me a coffee! Every bit helps! Billy is down about the world but knows where to find HOPE! This MAY be a bit more autobiographical than usual... and the good news is, the new STAR WARS movie is pretty good. 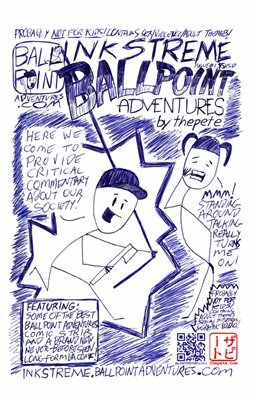 Don't forget to download the first BALLPOINT ADVENTURES mini-comic!! It's a 6.8MB PDF that looks great in iBooks or Adobe Acrobat for mobile devices!! Download it now and let me know what you think! From 2006: Billy challenges God to a duel. God's response is typical. Billy is Psyched About #RussianHackers! There is more to this comic! Download the PDFed mini-comic version of this week's new comic by going to finetip.ballpointadventures.com! You will end up at a PDF on go.thepete.org. Just FYI. This PDF is an experiment. Read it like you would a book. Flip through each comic panel like it's a page in an e-book. Since it's a PDF, it means you can share it easily with friends. Just email it to 'em or send them the link and they can go download it, too! If you think the format is cool, let me know. I may do this again. Billy Knows a Threat to American Freedoms when He Sees one! From 2006: Billy proves #IntelligentDesign isn't a thing when it come to people. From 2006: Billy pokes a hole in #religion. Then, tell your friends, co-workers, family, pets, strangers on the street, tell everyone to sign this thing, too. We can pressure the electoral college into doing the right thing. For an explanation of why, keep reading. This is kinda serious, folks. This is clearly a case of the popular vote being the smart folks who know what's best. The last time it happened, Bush got us in a LOT of trouble (and it was obvious from the beginning that he would likely get us in that trouble). The popular vote represented the right direction to go in. Gore was not about to invade two countries and tank the economy. He was going to continue the Clinton years which were some of America's most prosperous. Likewise, Hillary Clinton would likely carry over many of Obama's policies and help keep the last 8 years of recovery on track. And like with Bush, it's obvious that Trump will get us into more trouble. And once again, clearly, the popular vote represents the best choice for America. So, please sign that petition so we can stop this from happening again. Sure, America can take it, but who knows how many people will die this time? When Bush lost the popular vote but got into office anyway, he waged two wars that saw hundreds of thousands of people die. In a sense, it's like we've traveled back in time with the knowledge of what will happen if the popular vote is ignored and a person who is clearly not fit to hold the office of the president is allowed to do so. Don't take this sitting down. We can change things this time. From 2006: Barbie is #praying and Billy wants to help! When I woke up, the morning of November 9th, the first thing I did was check my smart watch to see a breaking news notification pop-up and inform me that "President Obama has called Donald Trump to congratulate him on his victory." My stomach dropped and I immediate felt like I'd woken into a nightmare. Hence, my portmanteaux (mashup) resulting in the word "Nightmarica". At some point after that I realized that this would be a nightmare we'd not be waking from for a while. The good news is that there is this petition you can sign that calls for the Electoral College to vote for Hillary Clinton since she did win the popular vote and Trump is anything but qualified to hold the office of the president. This is ironic since the original idea behind the Electoral College was to prevent "the tyranny of the masses" (or something similar) from electing someone unqualified to hold the office of the president. So this petition is simply a call to the EC to honor their original reason for existing. Hey, feel like helping me out? Support me on Patreon (for just a buck-a-month if you want!) or buy my long-form comic, INKSTREME BALLPOINT ADVENTURES, or just buy me a coffee! Every bit helps! Thanks so much! From 2006: Barbie asks a good question about the American flag. Billy knows this has to be said and so do you. This simply had to be said. Billy & Barbie realize #HillaryClinton's shrinking lead is #Trump'ed up! By some sort of error within Blogger, this strip did not post when it should have. It sat in my queue as a draft for some reason. Regardless, I am glad it did since it ultimately relied on data that was utterly, completely incomplete and misleading. If anyone should suffer for what happened on November 8, 2016, it's the polling industry. They pretended their numbers were somehow accurate and indicative of how Americans would vote and yet it went the other way. Read on if you want to read my original commentary for this strip. It's still accurate, but the poll numbers I reference, obviously, weren't. From 2006: Billy proves something really depressing about the world. It's Halloween and the scariest thing around is the future. From 2006: Billy knows how to beat the NSA! From 2006: Billy figures out how to get the NSA to stop. Billy commits the Cardinal #Sin against #Feminism and pays for it! Barbie is worried Billy might say something to get himself in trouble. It's been a long time since Billy used his ax on someone! People are a fact of life. You can't escape having to deal with them eventually and, often, Billy's solution to them seems like the best option. I AM NOT ENDORSING VIOLENCE. I'm just saying it sure looks like fun sometimes. From 2006: Sometimes the right thing seems like the wrong thing and vice versa. It's the question Edward Snowden asked himself: Do I do what's right (principles), or do what is wrong (prison term). Then, there's also the aspect of the bar being set pretty low to get the accusation of treason these days. I mean, even on the liberal side of things, you could get some criticism pretty close to a treason accusation from some Hillary supporters if you threaten to vote Trump. I'm honestly nervous about even posting this strip because of how unstable our right to free speech has become. So, to be clear: I am not endorsing treason or treasonous acts in this strip or anywhere else. Yes, Billy is suppressing the urge to do something treasonous, but he IS resisting (and he IS fictional). But the urge is there because that's how messed up things were in 2006 when I drew this comic. It could be argued that things are even worse now but, even then, I am not endorsing any course of action, I'm just a cartoonist hoping that America is still a place where free discussion can occur. Oh, and hey, if you like what I do with this comic or anything else online, help me pay my rent this month! If you could support me on Patreon or if you can buy my long-form comic, INKSTREME BALLPOINT ADVENTURES, I'd really appreciate it! Thanks! You can also just buy me a coffee! Every bit helps! Barbie illustrates how she is at her best. From 2006: Billy Ballpoint likes being offensive in ways only #StickFigures can. Billy and Barbie ponder their choices in life. All 2 of 'em. From 1/1/6: Billy and Barbie return after a year+ off and are happy to see you! Barbie asks Billy a Universal Question. What's Your Answer? ...realistic, or sarcastic, or something else? Leave a comment below or reach out to me on Twitter. While you are pondering, please consider supporting me on Patreon! Or you can buy my long-form comic, INKSTREME BALLPOINT ADVENTURES! You can also just buy me a coffee! Every bit helps! Thanks for reading!! From 8/18/2004: Remember the Spoiler Candidate? Billy and Barbie celebrate Labor Day in a way only they can. From 8/10/2004: #BillyBallpoint shows #Barbie that #AmericanApathy goes both ways. From 7/26/2004: #BillyBallpoint runs head-long into #AmericanApathy. Billy & Barbie Ballpoint lament the loss of the @NightlyShow. Now, it's not like canceling The Nightly Show was like canceling any other underperforming (ratings-wise) comedy show. You're taking away a good chunk of underrepresented voices from the American media landscape. This is a serious tragedy that I don't think anyone fully grasps. The Nightly Show was providing the service of, not only, reporting on race and gender issues in a funny way, but also in helping teach white viewers that People of Color and women could be smart, funny and have something important to say. The idea that Comedy Central had expectations of audience size less than 2 years into The Nightly Show's run seems pretty absurd to me. I mean, how many shows helmed by black hosts are there? Isn't it zero now? How do you measure the success of a show run largely by PoC? You can't compare it to other shows because there are no other shows like TNS. It's like putting a can of Coke in front of a caveman and getting angry at the Coca-Cola Company because the caveman doesn't chug the whole can immediately. It took a couple decades and a really cheap price to cement Coca-Cola as America's Sugar Water of Choice. You can't expect modern America to gloop down a healthy drink made by people with faces that, frankly, scare an all too sizable portion of them. Speaking of which, White America is still learning. We've come along way, but a lot of us are still dragging their heels. The media is where adults get their education (another fact, I don't think most people grasp) and taking a metaphorical megaphone away from even a few People of Color, even by canceling just one show, holds America back as a people. Like Barbie said above--shutting down one show run by so many People of Color is removing a disturbingly large number of People of Color from the American media landscape. Do I need to hang a lampshade on this and suggest that it smacks of systemic racism? I'm not saying that someone at Comedy Central was like "Aw, that's a black show! Screw those guys! #CANCELED!" I suppose they're probably sexist, too, since there were a ton of talented women on that show, also. Maybe CC thinks they'll all get hired over at Full Frontal? From 7/19/2004: The leader of this country knows how corrupt he is. This week, #Billy and #BarbieBallpoint learn they can't have nice things. From 7/12/2004: Billy and Barbie know better than to make any serious life plans. #BarbieBallpoint is SO excited to vote for a ladyyyy! From 7/5/2004: #BarbieBallpoint teaches #BillyBallpoint that sometimes folks don't want help! Billy and Barbie are excited the primaries are over. Or not. From 12/29/2003: #BillyBallpoint has found a solution to too many white people on TV! #BillyBallpoint takes on #AllLivesMatter, #BlackLivesMatter, & #BlueLivesMatter!